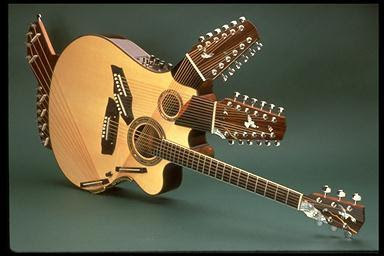 This is a crazy looking device, but it is actually a working guitar. Genius jazz guitarist Pat Metheny uses one of these, and its called a "Pikasso," a 42-string guitar. Its closely related to a "harp guitar" that combines a harp with a guitar. You'd think all those crossing strings would interfere with each other, but apparently it plays fine. You can see Metheny in concert playing one of these at Youtube.